In this issue: Stars visit the pianos, more concerts, a peek behind the scenes, and a call for your help finding forever homes. — Piano. Push. Play. In this issue: Stars visit the pianos, more concerts, a peek behind the scenes, and a call for your help finding forever homes. We were tickled and pleased to see recording artists Al Yankovic and the duoibeyi visit the pianos. They both visited the piano designed by the team led by Tony, Paige, and Ron of Doug Fir Lounge. Ron told us, "This year's contribution entitled “Heroes” is inspired by recently passed pop icons David Bowie and Prince. Featuring a glam-inspired David Bowie lightning bolt and purple Prince backgrounds, the piano is a tribute to two of Pop’s most influential cultural icons." And the stars loved it! Also this week, we've got two new concerts for you and a special peek behind the scenes. Keep scrolling! Divergent Opera artists will be performing their amazing repertoire, followed by an intriguing performance by Mitchell Falconer. Musician, songwriter, and vocalist Glasys (Gil Assayas) will be creating his unique music live. It’s dark. Dust motes float in shafts of light filtering from the skylights far above. The smell of old, dry wood is everywhere. Scores of dark, rectangular shapes wait in the shadows, silent. A woman with a flashlight walks between the rows. She finds the one she’s looking for and brushes the dust off the bench. Sitting and opening the keyboard cover, she tries a few chords. She plays each key one at a time from top to bottom. She stops on the ones that seem to be having trouble and tries them several times. She opens the case and peers inside. “This one might work,” she says. Megan McGeorge has rescued another piano. Every year, uncountable pianos are sent to the dump. Unloved, unsellable, these aged instruments are not worth the money it would take to refurbish them and keep them in tune. Nobody wants them. But we think there’s an afterlife for these pianos, a place where people will still love and play each one. A forever home. 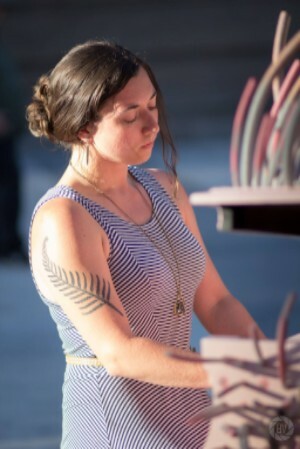 Megan mixes and matches salvageable pianos with designers and artists she knows. These good people take the instrument in, refurbish it, clean it up, and then the magic begins. They infuse each one with their vision, their style, their unique perspective on music, on sound, on color, on Portland. They take these pianos and dress them up in their Sunday best. Then, of course, it’s out on the streets for these beauties. Our team of tuners and movers get them in shape and place them on street corners, in parks, and among food carts so everybody can enjoy them. Tuner and piano tech extraodinaire Alvin Alghrim uses a little heat on Laurieto gently coax one of her felt hammers back in line. Each piano gets tuned several times, both before and while it's on the streets. Life on the streets can be tough. Keys start to stick. Pedals get knocked off. And, despite our best efforts, sometimes it rains in Portland in July. But for rescued pianos like these, it’s a last chance at life, a final performance, a couple of weeks where they can once again be played, be heard, and be appreciated. The strong ones, the lucky ones survive. Still sounding sweet and looking fabulous, they come off the streets ready for another encore. And we’re ready for them. We find places in the community that love music, that honor musicianship, and we give these pianos away with a final refurbishment and the promise of an annual tuning. Places like King School, Revolution Hall, Good News Health Clinic, ADX Portland, Portland Playhouse, Cymaspace, and others. Some pianos you can visit (check our app) and some play for a private audience. We make sure they all are loved and played for years to come. This year, we need your help. We’ve already got a few forever homes in mind, but we’d love to hear from you. Do you know of some place that needs a piano? Please let us know in the comment thread on this post on our Facebook page. Newer Post Forever homes, students, and our season farewell concert! Older Post Music on the streets in the summertime. Encore performances!